Buccaneers pointless start to life in Division 1A of the Ulster Bank League continued at Dubarry Park when they went down 32-24 to Young Munster in a spirited contest played in glorious sunshine on Saturday. A final quarter fadeout again cost the Midlanders dearly in this must win basement battle, as the physically stronger visitors claimed three tries to overhaul an eleven points deficit in a committed and entertaining joust. Wearing their canary yellow away strip, Buccs made three changes for this encounter. All were enforced and all in their backline, which contained four U20 players, including centre Corey Reid, in for injured Danie Poolman, and scrumhalf Frankie Hopkins, who started in place of Connacht-tied Conor McKeon. Will O’Brien debuted at fullback, with Luke Carty switching to outhalf instead of Alan Gaughan, who opted for GAA duty with Athlone. Conor Kenny make a swift recovery from last week’s injury, so the Pirates pack was unchanged. Carty opened the scoring with a third minute penalty for the hosts. Following a long period of advantage, Conor Hayes stroked over a Young Munster penalty four minutes later. Weak home tackling contributed to the visitors making ground in the build-up to their opening try by Ben Kilkenny on 13 minutes. The Cookies enjoyed a slice of good fortune in securing their next score, another unconverted Kilkenny try after 28 minutes. Reid lost possession through an unpunished high tackle on his own 22, and the Limerick side’s captain finished off their counter attack along the right flank to put Young Munster 13-3 to the good. A powerful charge by Peter Claffey down the left five minutes later was finished in determined fashion by Hopkins for a try which Carty converted. Then a rousing Martin Staunton surge followed as Buccs took the game to the visitors, but they suffered a setback in the closing stages of the half when injury forced the influential Dan Law off. 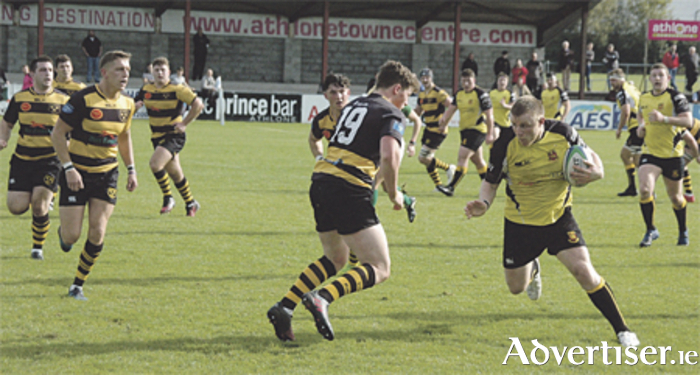 The Athlone side trailed 13-10 at the break. Three minutes after the change of ends, Rory O’Connor perfectly read Young Munster’s intentions to swoop on a pass and race away for an intercept try between the posts. Carty duly converted, but was then short with a 49th minute penalty from the 10 metre line. However, Buccs had the bit between their teeth, and Paul Boyle, Reid and Ronan Farrell were all involved in a tremendous 50th minute move that should have earned O’Connor his second try, but referee Joy Neville, from some distance back, instead awarded a five metre scrum to the hosts. It merely delayed the score as, after fine work by the pack, Hopkins bravely dived through a tangle of bodies for a try. Carty’s excellent conversion from the left put Buccaneers 24-13 ahead and home supporters began to believe that their team could finally taste 1A victory. But, alas, their final quarter travails persisted, as Peter Meyer was allowed far too much room in getting close to the home line, where Young Munster earned a penalty. They opted for a scrum from which they earned a second penalty, and Jack Lyons quick tap and go caught Buccs napping as he darted in for a 58th minute try which Hayes converted to narrow the home side’s advantage. The Limerick side were rejuvenated by this score and they followed it up with good handling and awareness to edge ahead. Daniel Hurley finished off cross field pass with an unconverted 64th minute try that guaranteed Young Munster a bonus point. Crucially, this score put them ahead by 25-24. Try as they might, Buccaneers just could not breach Young Munster’s committed defence in the closing stages, and Gavin Coombes try six minutes from the finish, converted by Hayes, ensured that the Pirates finished empty-handed for their third game in 1A. Young Munster had more of an edge to their efforts, especially in the tight where their pack had a size advantage, and they forced quite a number of turnovers throughout. Young fullback, Hayes, was their most potent performer in this priceless 32-24 victory for the Munster club. Buccs have been very much in contention in all three games to date without any reward. The ever-willing Simon Meagher was named Audi Athlone man of the match and John Sutton, Claffey and Boyle also did their utmost in the forwards exchanges. U20s halfback duo, Hopkins and Carty, did very well, while O’Connor was always a threat in the backline, where O’Brien performed impressively on his first appearance for Buccaneers. Buccaneers travel to Castle Avenue on Saturday to square up to Clontarf in the fourth round of the Ulster Bank League Division 1A, with kick-off 2.30pm.